At most music festivals, the biggest nuisance are hippies: the peace-peddling, kaftan-wearing beardy folk who, quite often, smell like stoats. But at Kenya’s Rift Valley Festival, it’s less about dodging hippies and more about keeping out the hippos. Lurch around the festival site, on the shores of Lake Naivasha (a bumpy 1.5 hour drive from Nairobi) and you’re constantly besieged by reminders that the three-tonne, sharp-toothed beasts (mozzies aside, Africa’s biggest killer) are never far away – an electric fence here, a sign asserting, ‘Hippos Are Fun To Watch From A Distance’ there. The official line? Festival-goers should tread carefully as it really is a jungle out there. 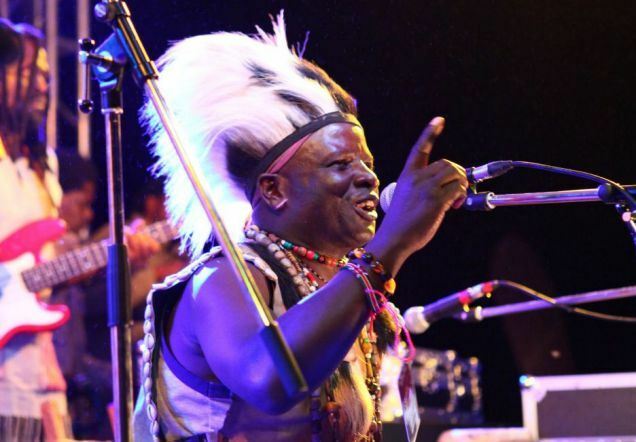 Billed as a “musical experience in the cradle of mankind”, the Rift Valley festival was founded by Brit brothers Ivan and Sean Ross in 2010, and has since billowed from tiny word-of-mouth gathering to 5,000-capacity jamboree with exuberant crowds, scenic views and shimmering Afrobeat. The line-up combines local talent with international artists such as DJ Yoda, Dan Greenpeace and a Gorillaz DJ-set, many of whom have waived usually ginormous fees to be here. Just as well, because all festival proceeds go to charity, ranging from local community projects to saving the mountain bongo (not a drum, but a critically-endangered antelope). Despite the festival’s irrepressibly fun spirit, it’s beset by technical glitches. Indeed, there’s a sense not even Mussolini could get African musical festivals to run on time. On Day One, the 5pm start time gets pushed back until 7pm, then 10pm. British DJs show up on-site to find their comfy 9pm set has now been postponed until two-in-the-morning. Then at 8pm, a rusty 1920s-era generator triggers a half-hour power cut, which plunges the entire site into darkness. Forty-five minutes later, there’s another one. Ivan and Sean run around like headless zeedonks, while everybody else sups Tusker beer as if nothing has happened. Finally, at 10.40pm, the first band saunters onstage. DJ Yoda plays a continent-specific playlist (think The Chemical Brothers’ It Began In Afrika), a local band covers Empire State of Mind with Nairobi deputising for New York, while the audience (comprising locals, backpackers, middle-class Nairobians and the odd do-gooding gap-year student) throw all manner of shapes around you. Dances big in Kenya include ‘The Helicopter’ (spinning around in a circular motion akin to a propeller), ‘The Chicken Dance’ (involves emulating Chicken Tonight ad circa 1996), ‘The Skip’ (pretending you’re on a skipping rope) and something best described as the kind of moves a constipated teapot would make. One chap, who we’ll call Mr Tickle, likes to boogie by running up to strangers and air-tickling them from behind. “I guess it rains down in Africa,” pondered Toto in their 1983 meteorological paean to the continent. And so it does. In fact, there’s so much rain, the already-creaking stage roof collapses under the deluge. While Kenya’s drought-stricken north might appreciate such a downpour (unseasonable for this time of year, apparently), it doesn’t augur so well for festivals – there’s talk of the final day being cancelled. Fortunately, things are salvaged when a makeshift PA is set up in a chalet on the grounds. A smoky barbecue is on the go, an upturned crate becomes the ‘bar’ while middle-aged Kenyan soulstress Suzanna Owiyo warbles away onstage. It’s a quintessentially African scene and an uplifting coda to the fun of the previous three nights. Mr Tickle is back, as is the man-on-crutches, wearing a T-shirt with blinking LED lights. At the end of Owiyo’s set, he storms the stage, thanking her for her music (“It’s always been my dream to see you, Ms Owiyo”) before raising a triumphant crutch in the air. 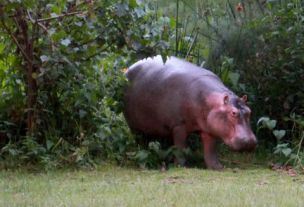 And somewhere towards the back of the site, safely ensconced behind an electric fence, a bloat of hippos gazes on, probably wondering, like us, how they can get in next year.